Pulmonary blood flow in cases of pulmonary atresia may be provided by the ductus arteriosus or by aorto-pulmonary collaterals. Collateral arteries may arise from coronary arteries and rarely they may be the sole source of pulmonary blood flow. We describe a 2 month old baby with pulmonary atresia whose pulmonary blood flow was solely dependent on collaterals form coronary arteries. A 2-month-old baby was referred with a diagnosis of large subaortic ventricular septal defect (VSD) with valvar pulmonary atresia. Detailed echocardiogram revealed that the origin of the left coronary artery (LCA) and right coronary artery (RCA) was dilated. The proximal LCA was supplying a large collateral to the pulmonary artery and subsequently dividing into left anterior descending artery and left circumflex artery [Video 1], [Video 2] and [Figure 1]a, [Figure 1]b, [Figure 2]a, [Figure 2]b. 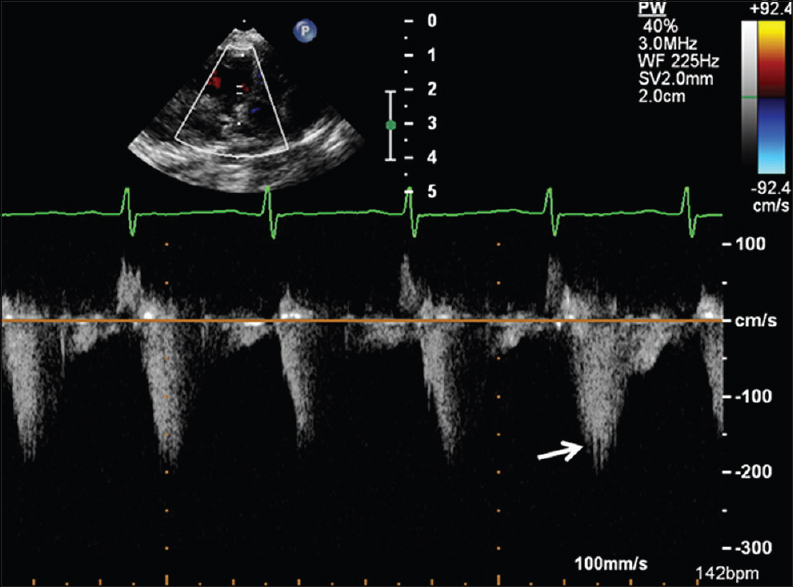 A large collateral artery from the proximal RCA was coursing anterior to the aorta and was supplying the pulmonary artery near the pulmonary valve [Video 3] and [Figure 1]a, [Figure 1]b, [Figure 2]a, [Figure 2]b. Pulse Doppler of the collateral flow demonstrated that predominant flow into the pulmonary artery occurred during systole [Figure 3]. Cardiac computed tomography confirmed the coronary collaterals to the pulmonary artery [Figure 4] and showed that there were no other aortopulmonary collaterals, making this a coronary dependent pulmonary circulation. Coronary collaterals to the pulmonary artery have been described in ~10% cases with VSD and pulmonary atresia. These coronary collaterals developmentally resemble the ductus arteriosus rather than the systemic to pulmonary artery collaterals, in that they tend to insert to the central pulmonary artery. 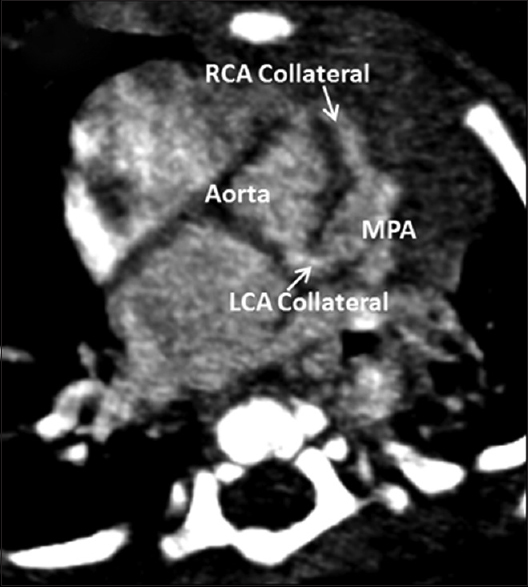 These collaterals commonly arise from the LCA and less commonly from the RCA. They are usually associated with the presence of other systemic to pulmonary collateral arteries. None of the patients with coronary collaterals have documented coronary ischemia as coronary flow is dependent primarily on the state of the distal coronary bed as long as there is no proximal coronary stenosis. Studies with flow wire into these collaterals have demonstrated that flow to the pulmonary artery occurs during systole (as seen in our case) while the flow to the distal coronary bed occurs in diastole. Although coronary collaterals are not rare, collaterals from both the left and right coronary system in the same patient, with the absence of other systemic collaterals, have not been previously reported. As there is absolute dependence of the pulmonary circulation on the coronary arterial supply, early intracardiac repair is planned with ligation of the coronary collaterals. Amin Z, McElhinney DB, Reddy VM, Moore P, Hanley FL, Teitel DF, et al. Coronary to pulmonary artery collaterals in patients with pulmonary atresia and ventricular septal defect. Ann Thorac Surg 2000;70:119-23. Byeon JH, Jung MH, Youn HJ. Coronary artery collateral flow and its effect on myocardial perfusion in a patient with unilateral pulmonary artery atresia. Cardiol Young 2016;26:827-30. Kochiadakis GE, Chrysostomakis SI, Igoumenidis NE, Skalidis EI, Vardas PE. Anomalous collateral from the coronary artery to the affected lung in a case of congenital absence of the left pulmonary artery: Effect on coronary circulation. Chest 2002;121:2063-6.